Our <em>pa</em>-expert predictions for the first round, up ahead! The annual PBA Draft will take place this Sunday, August 23, at Robinsons Place Manila. 64 hopefuls have sent their application for the draft, and although NBA-aspirant Bobby Ray Parks Jr. isn’t among them, the pool is filled with players who are ready to hoop it up with the big boys. There will be no draft lottery this year (Chito Salud may have had a hand on that–get it, hand? ), as the draft order is based on a mathematical computation of each team’s performance last season. You can check out how it was computed here, but take note that some of the picks have already been traded. The Philippine Cup and Governors' Cup Champion San Miguel and Barako Bull do not have picks in the first round as a result of previous trades. So, who do you think will be picked high in the draft and who will be, sadly, handed the "Better luck next time" card? Due to all these rookie talks and hype analysis leading to the local pro league's 41st season, we came up with our own pa-expert predictions for the first round. 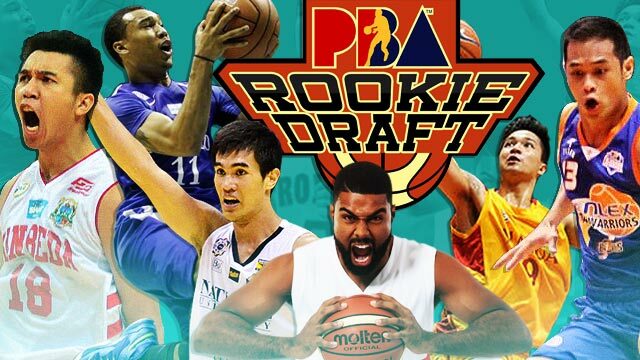 Read on for the FHM 2015 PBA Mock Rookie Draft! He is probably why many were surprised by last year’s trade that sent Kevin Alas to Talk 'N Text. The deal allowed the Tropang Texters to remain contenders while in the process of rebuilding. They look set to pick the PBA D-League Most Valuable Player who has been the consensus top pick ever since Parks opted out. Sure, taking Troy Rosario and making sure he’s part of the Gilas program for years to come could be an option Talk 'N Text is thinking about, but they probably won’t pass on a talent such as Tautuaa. His combination of size and skill is a game-changer worthy of the top pick. He's like a (slightly) smaller version of Asi Taulava—arguably the most dominant center to play in the league. The Gilas Cadet standout had a breakout season in his final year in the UAAP as he led the Bulldogs to their first championship in 60 years. His rise didn’t stop there; he helped the Philippines win the gold in the SEABA competition earlier this year. Despite alleged multiple offers for the pick, Mahindra (formerly Kia) has (so far) decided to keep the second overall pick as they look to put more numbers on their win column this upcoming season. No doubt, Rosario will be a key player for the team's future. While Coach Yeng has said that he’s looking for a big man first before a wing, don’t be surprised if he picks one of the best talents in the draft for his first pick. The King Lion is leading the charge for San Beda in Season 91 of the NCAA Basketball tournament with all-around averages. Dela Cruz has evolved into a legitimate superstar after being a role player in the stacked Ateneo lineup in his rookie year. He has an outside touch, a knack for passing, and a nose for rebounds–he’ll fit right in with the Elasto Painters. One of the best available guards in the draft, Lanete has shown his ability to win in all levels he’s played in. He was a champion in the NCAA with the San Beda Red Lions, in the PBA D-League with Hapee and NLEX, and as part of the Gilas program. Though he was already eligible to be drafted last year, he decided to skip the draft in order to train more with the national team. The Bolts just traded for a returning Jimmy Alapag, and they could get this opportunity to have Garvo under his wing as he did with Jayson Castro in Talk 'N Text. The Gin Kings are headed to a new era with Tim Cone, and eventually, one without the iconic pairing of Mark Caguioa and Jay Jay Helterbrand. Sumang could fit Ginebra’s NSD spirit and revitalize a fanbase hungry for a "fighting" Ginebra team. The feisty guard out of the University of the East surprised his alma mater by forgoing his final year of eligibility, but could find himself in a favorable spot in the pros. The NLEX Road Warriors rely heavily on Asi Taulava as their man in the middle. If your team’s best big is a 42-year-old center, you should be looking for some young blood to boost the post. Torres should fit that need, and with Taulava and Enrico Villanueva mentoring him, he will have an easier transition to becoming a solid rotation player in the PBA. The Meralco Bolts is a team filled with energy guys like Jared Dillinger, Cliff Hodge, and Sean Anthony. With the return of Rabeh Al-Hussaini, a big man may not be their main priority just yet. They can, however, continue to build on a fast-paced lineup by adding Newsome. Coach Norman Black knows how to best utilize Newsome’s talents, having coached the draft hopeful during their time in Ateneo. The Star Hotshots are stacked with great players, but they are not getting any younger. With rookie coach Jason Webb taking over the team, they will look to have the best available talent in the draft to improve their team moving forward. Enter Scottie Thompson, last year’s NCAA MVP who’s still performing at a high level for the Perpetual Help Altas. He’s been a triple-double machine towards the end of the first half of the current NCAA season, and he can be a steady contributor right out of the draft. This pick could have been Moala Tautuaa! We’ll probably never know why the Elite traded away their top pick for this one, but who are we to speculate? Anyway, with the ninth pick in the draft, they may not have the game-changer that they wanted, but they could get a potential star in Nimes. The swingman from Mapua impressed many experts during his rookie season, where he won Rookie of the Year honors. However, injuries caused him to miss the past two NCAA seasons. If he can stay healthy, he’ll be a nice building piece for the young Blackwater team. The enigmatic guard from Cal State may not be known to many, but he’s already made quite an impression on league and Internet scouts. His name is being floated as one of the surprises in the draft. He also has US NCAA Division I and NBA D-League experience. At 27 years old, he’s not exactly a young rookie but, much like Stanley Pringle, Wetherell may already be an impact player as soon as his first game in the league. The Aces figured in two of the three Finals series last season against the San Miguel Beermen. Though they have a solid system in place, they clearly lacked the size to defend June Mar Fajardo one on one. Their aging frontcourt needs a boost (no, the Sam Eman experiment is long over, and it yielded unimpressive results), and could get that from Guinto. Not much is known about the Bulacan-born, Australia-raised big man of San Sebastian. However, he’s one of the bright spots of the team, and could help the Aces keep Abueva in the small forward role against bigger teams. Coach Yeng Guiao said he needed a big man, and if Khobuntin is available at number 12, he’ll happily welcome him to the Elasto Painters family. Khobuntin is a physical player who plays the role asked of him. He is also a player who won't back down from a challenge, as seen from a scuffle during a game against a much older Thai team during the recent SEABA tournament.